Most Attempts At Behavioural Change Fail! Behavioural change is not easy. Have you ever tried to change a long-standing habit or create a new habit? Perhaps you tried to give up smoking, eat fewer sugary foods, start taking regular exercise, or just spend less time on social media. It’s often difficult isn’t it and the same is the case when we try to change the behaviour of website visitors. Indeed, studies suggest that most attempts at behavioural change fail. BJ Fogg’s Stanford Persuasion Lab conducts research on behavioural change using technology. The BJ Fogg Behaviour Model explains how three elements must converge simultaneously for a behaviour to occur. The model highlights that for people to complete a task they need the necessary motivation, the ability and a trigger to prompt the behaviour. When an action does not occur, at least one of these three elements must be missing. Fogg highlights three key motivators; Sensation, Anticipation and Belonging. Each motivator has two sides; pleasure/pain, hope/fear and acceptance/rejection. Although this is a simplistic model of motivation, these core motivations can be applied to all uses and they get us to consider psychological drivers of behaviour. If you want someone to do something they must have the ability to do so. It might seem obvious, but we sometimes wrongly assume everyone knows what we know and that they have the same skills as we do. We have two options here. We can either train people to improve their skills or we can reduce friction by making the target behaviour easier to complete. Training or on-boarding is the more difficult route as people are generally impatient and lazy. As a result users will often avoid having to learn new skills. Designing an intuitive interface is normally a much better option as this fits much more closely with human nature. Simplifying an action to make it easier to complete should be your preferred option in most cases. Ease of completion is a function of our scarcest resource. This is often either our time or money. Users are very impatient and so a behaviour that requires more than a few seconds may fail because the user is not prepared to sacrifice the time needed to complete it. This is why it is sometimes a good idea to inform users how long an action will take to manage expectations and encourage them to allow the necessary time for the task. Money is another scarce resource and so if a behaviour needs £25 to complete and you don’t have £25 to spend, then it’s not easy is it. This is why a free trial can be an effective way of reducing friction to undertaking a behaviour. Prompts or triggers remind us to begin a task and without a prompt the target behaviour will not occur. There are lots of different names for prompts; reminders, call-to-actions, requests and cue to name but a few. Prompts can be an external reminder, such as a mobile phone push notification or a pop-up message on a website. On other occasions our daily routine or habits may prompt a behaviour. For many people in large cities going to work prompts them to buying a coffee or checking Facebook may remind us to upload our latest photos. Some of the most powerful prompts though are major life events such as starting work, marriage, moving home, birth of a child and children leaving home. I sometimes play poker on Facebook with Zynga the online gaming company. 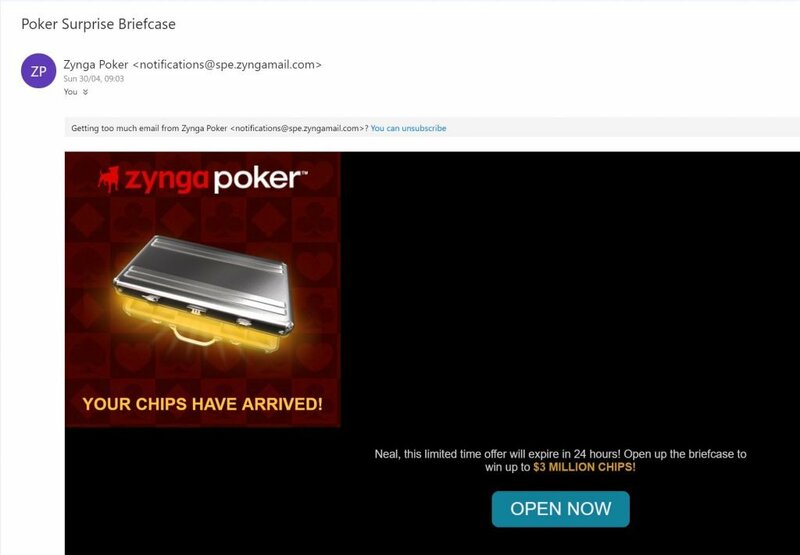 I haven’t played for a week or two and so Zynga sent me an email offering me the chance to win some free chips. The prompt is a simple call to action of Open Now. The motivation involves scarcity as the offer expires within 24 hours of receiving the email. Although the target behaviour is to get me to sign in and claim my prize, Zynga’s larger objective is to get me playing a game of poker. The use of loss aversion is an effective way to motivate me to click on the call to action and as Facebook remembers my login details the behaviour is very easy to complete. 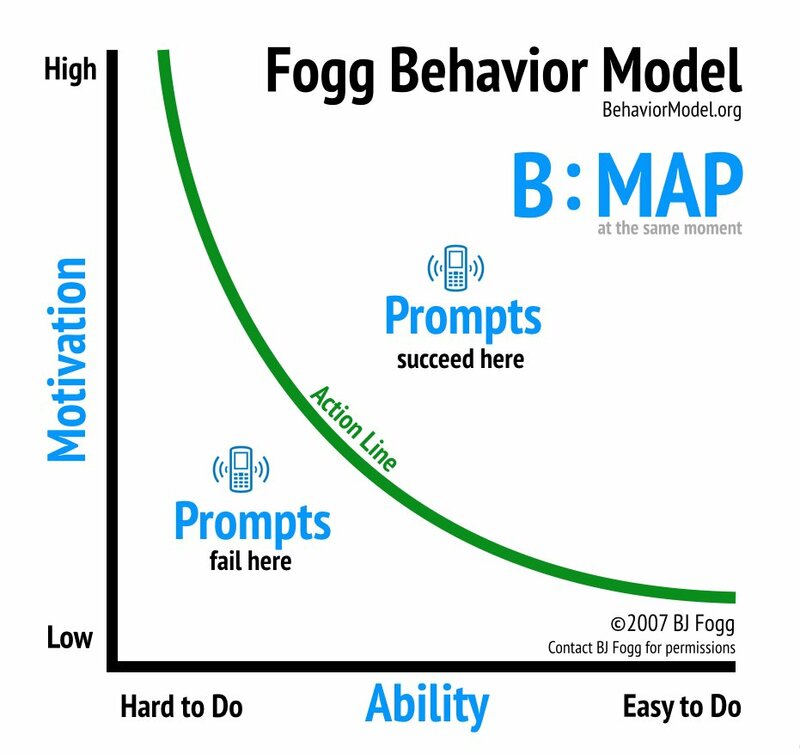 The Fogg model is a powerful resource for evaluating how to encourage behavioural change in digital marketing as it has been specifically constructed for use with technology. People buy benefits rather than features and so it is important understand your customer’s needs and what they want from your product or service. Marketers need to communicate a compelling value proposition that includes implicit (psychological) goals and more rational (explicit) goals to motivate users. This needs to be sufficiently appealing to justify changing their behaviour and perhaps switching to a new supplier. So before designing a page or website first consider what need your product or service is solving and how important is it to your prospects. Make sure you identify the most important needs so that you don’t make the mistake of promoting something that is not salient to your customers. Use the implicit association test to identify psychological motivations as people don’t have full access to our deeper, emotional drivers. Evidence of social proof can further enhance the perceived value to prospects because of our natural herd instincts. However, perhaps most crucially is that your value proposition is communicated with engaging imagery and compelling copy to persuade visitors that it will deliver on your brand promise. Rewards can be used to provide a further motivation to complete a task. However, make sure the reward is something people want and be careful to adjust the frequency of the reward to optimise its effectiveness. Read my post on the psychology of rewards for more details. If your target behavioural change that is not easy and simple for visitors to undertake it will create friction which can prevent even the most motivated user from completing a task. Apart from being lazy, people have limited attention spans and are often interrupted when browsing. This is what it’s important that the user experience is intuitive and there is a clear visual hierarchy. To get an assessment of how much your site suffers from friction try undertaking usability testing. Observing visitors trying to navigate and complete tasks on your site is much more insightful than asking them direct questions. Your analytics can tell you where there may be a bottleneck, but usability testing tells you why there is a problem. Browser replay tools, such as Hotjar can also help identify where problems may occur. Session replay recordings are like undirected usability tests as you don’t know for sure what visitors are trying to achieve. However, by encouraging people in your organisation to spend time watching session recordings it is surprising how frequently usability problems are identified. 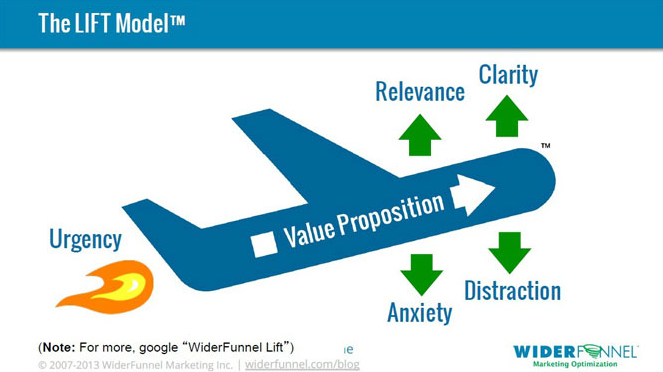 I find a heuristic evaluation with the help of WiderFunnel’s Lift Model is also very useful at highlighting potential shortcomings with a screen or user journey. This begins with the value proposition and how compelling it is to your prospects. Use the model as a check list of what to look out for and you will soon come up with a long list of items to consider. There are some elements of web design that consistently cause friction and result in a poor user experience. Friction can reduce both our ability to complete a task, but the anxiety it creates can also harm motivation. So, if you have any of the following friction generators on your site I would recommend that you remove them if it all possible. Let me say this once. A registration page is not a landing page! Sending off-site visitors directly to your registration form is lazy marketing. 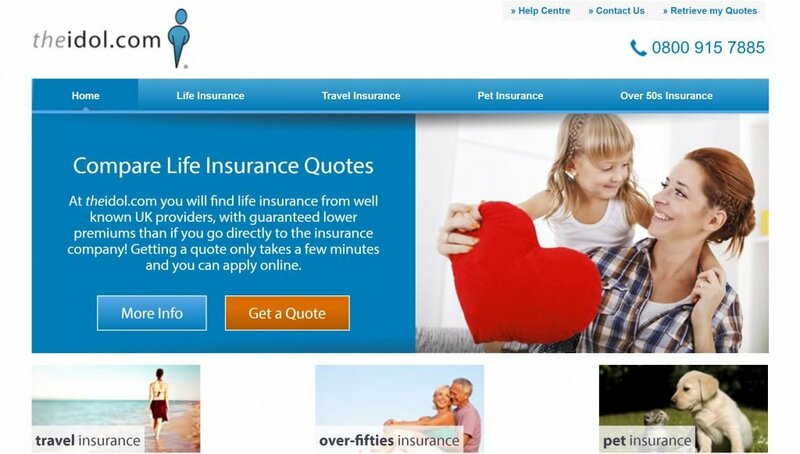 Use a dedicated landing page that is designed to inform and persuade. If you have a very short sign-up process you may be able to include it on your landing page, but don’t use a standard sign-up form as a landing page. Registration pages should not have to be designed to inform visitors about your value proposition. They should be focused on getting visitors through the sign-up process and not to persuade them that your offer is right for them. It’s also a poor user experience as it doesn’t conform to visitor’s expectations. When a user clicks on a call-to-action button to launch a form to input information for a quotation or open an account the expectation is very clear. The visitor anticipates being taken directly to the form. Given this strong expectation it is not advisable to interrupt the user journey with a pop-up or interstitial to offer users another choice. 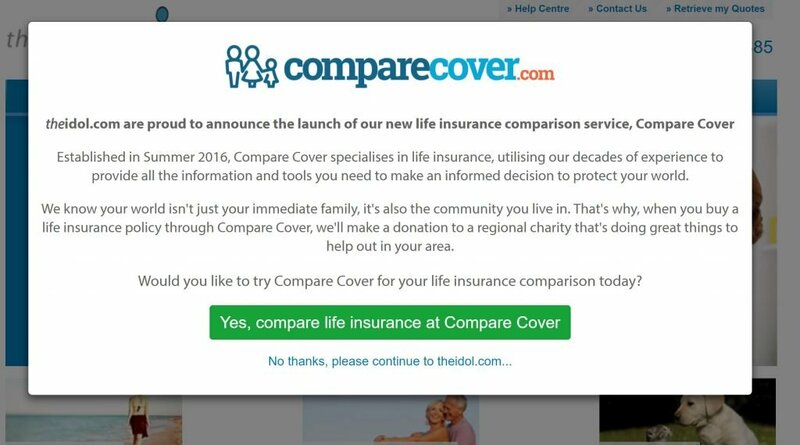 Theidol.com launch a pop-up to promote their comparison service immediately after the user clicks on “Get a Quote” CTA. This is a poor user experience as it is confusing for the visitor. The risk with interrupting the user journey in this way is that it’s not meeting customer expectations and can be perceived as too aggressive. It would have been better to offer the price comparison service as the primary CTA on the home page and made the existing option of getting a single quote a secondary CTA. Forms are a common source of friction and so it is important to take care when designing them. Use use recognised best practice for web form design. However, CAPTCHA fields are notorious for annoying and frustrating users. They are often implemented by IT security teams to protect a site against bots, but there many other better ways of achieving the same aim without causing friction. When a user lands on your site many will not be ready to convert. If they have never been to your site before they need to establish your credibility and may want to browse to find out more about what you offer. However, many sites wrongly assume that visitors are ready to convert on their first visit and offer no secondary call to action. To build visitor motivation it is necessary to design user journeys that allow for establishing credentials (e.g. customer testimonials and awards), information gathering (e.g. white papers or blogs) and lead capture (e.g. newsletter sign up form). Always include a secondary CTA as people like to have a choice and you need to allow for those users who are not yet ready to commit. The above homepage from theidol.com prominently displays a primary and secondary CTA to give users the choice. This helps behavioural change because relevant triggers are clearly visible for most visitors. So many websites have auto-sliders or carousels on homepages that you would be forgiven for assuming that they must be an effective means of communicating multiple products or value propositions. Management love them because they can allow them to avoid making difficult decisions about what should be on their homepage. Here is the carousel on Very.co.uk which changes every few seconds as the user is reading the text. This can also be annoying to visitors if they are not fast readers. However, the vast majority of A/B tests and usability studies have shown that few users interact with sliders and they often harm conversion rates. Because carousels often look like adverts they are frequently ignored and have few clicks on calls to actions. In addition, even fewer visitors click on second, third and other panels that are included in a carousel. This means that prime real estate on your homepage is not performing effectively and so should be removed. When a visitor successfully completes your registration process, don’t dump them into a blank page and expect them to work out where to go next. Make sure you provide a suitable welcome message and provide on-boarding information or cues. It’s an important stage in the user journey, and so make sure you take advantage of it with suitable content. 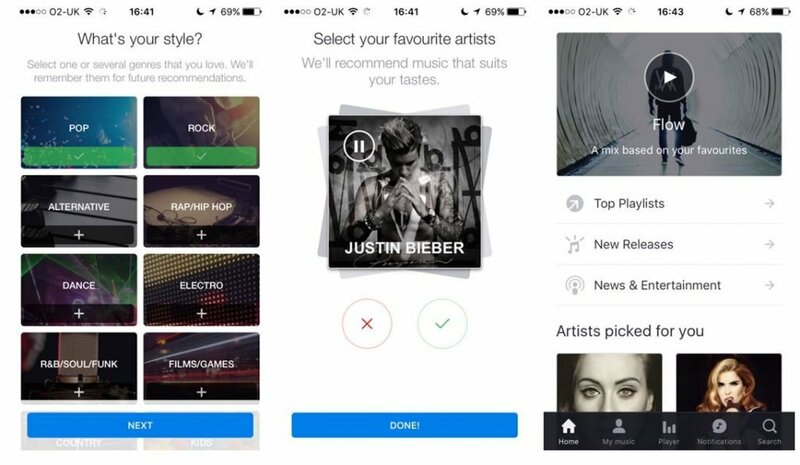 Deezer, the music streaming app, has a simple and easy on-boarding process. When a user completes a short sign-up form they are first asked to select music genres they like. Users are then asked to indicate their preference for a series of artists. Once this is complete the user is presented with a unique play list called “Flow” which reflects their music tastes. By demonstrating how easy it is to create a play list Deezer also hope to encourage behavioural change by making the process very easy. Data has shown that customers who create their own play lists are much more loyal and less likely to cancel their subscription. BJ Fogg’s behavioural change model is a powerful framework for considering how we can nudge visitors towards their goals. Most attempts at behavioural change fail, not because people can’t change, but rather because at least one element is missing. People need a prompt, but also the ability and motivation to change. Use this framework to identify which elements are missing in your user journey and address these deficiencies to improve your chance of success.